The bitter rivals have once again found themselves facing off, will Da N00bz take back their stolen pride? 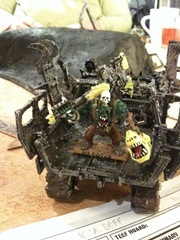 Once again Grimfang, Da Yella Deff’s de facto second in command is manning Grin, the mob’s buggy. 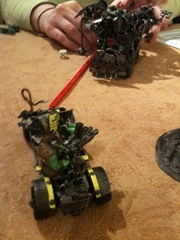 Zagwazza goes a little pale as he sees Keith, Da N00bz enormous trukk barrelling towards him! Driving comes naturally to Morkers, otherwise Grin would have been toast. Today Mork smiled upon Zagwazza and Grin pulled through moderately unscathed. The same could not be said for Keith! Its driver, Leonard, tried valiantly but the lads were headed straight for that very solid-looking hill. Crunch! 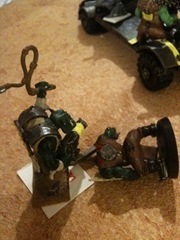 That was Keith immobilised again, ouch. What Da N00bz lack in driving skills, they certainly make up for in sheer numbers. 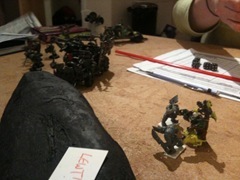 Stacks of warriors spill forth from Keith, blades and shootas at the ready.. Remember Vern from the previous match? He tried to take out the Yella Deff’s first grot, Snik, and got run down in return. Well, this time Grimfang wasn’t feeling so merciful, his hand-to-hand skills sharp after the last game. Down goes Vern! Nazgrab’s boys manage to take down four of Da N00bz but is it enough? Not to be put off so easily, their nerve holds. Just because a few lads went down, ain’t reason to be giving up. 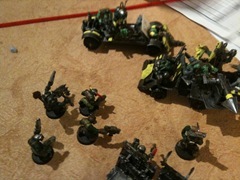 Eugene urges on his boyz! With Krunch closing in and the rest of Da Yella Deff not far behind, a desperate plan is hatched. 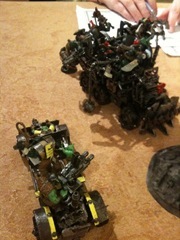 The lads may not be able to make it back to the trukk to claim the scrap on their own, but maybe by passing it from one lad to the other..? Let’s play “Pass Da Scrap”! Innovative tactics just weren’t enough. Several of Da N00bz legged it with the scrap they were carrying, but this victory went to Nazgrab, who grabbed two of Da N00bz (and their trukk!) and dragged them back to his fort. 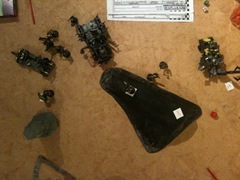 Nazgrab’s lads currently hold two captive orks and a trukk. Da N00bz are plotting their revenge.. 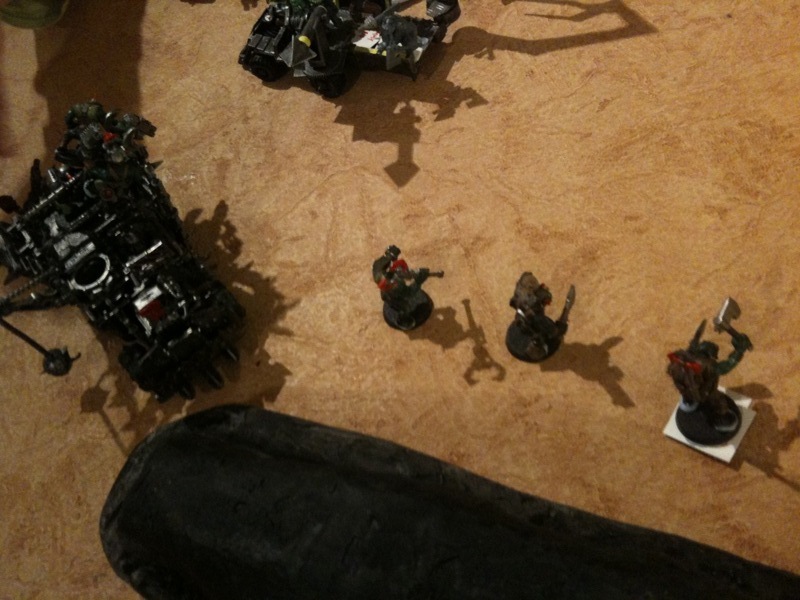 This entry was posted on Saturday, November 14th, 2009 at 23:27	and is filed under Battle Reports. You can follow any responses to this entry through the RSS 2.0 feed. You can leave a response, or trackback from your own site.